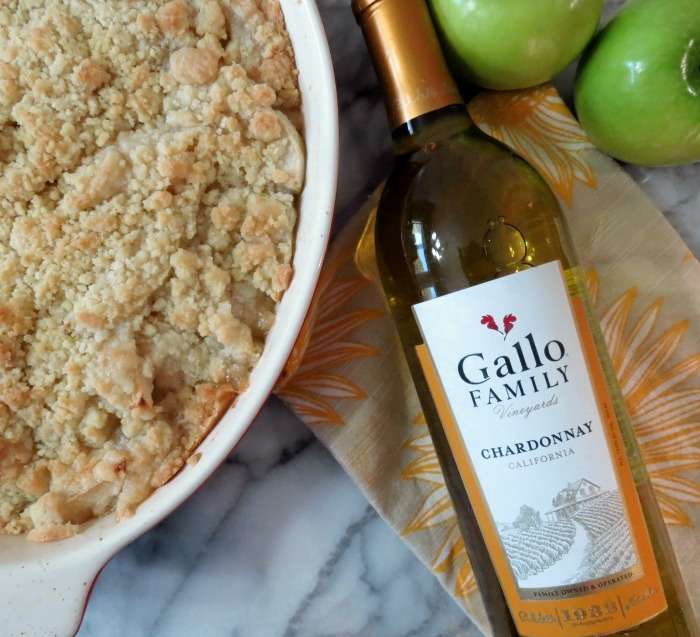 Today for #SundaySupper we teamed up with Gallo Family Vineyards to share with you “recipes with the best stories”. One of the best and most memorable stories I have is when my Mom came to visit me in California a few years ago. Whenever she comes for a visit I always make a special request and ask her to make at least one meal. Poor Mom, she comes out for a visit and she always ends up cooking. lol Now normally I ask for her to make her famous spare ribs or spaghetti sauce recipe, but on her last visit I decided on an old family favorite, her apple crisp. As a child I wasn’t one for helping out in the kitchen and even as an adult I didn’t help out too much, but on this recipe I decided to give her a hand. One thing you have to know, when my Mom came to visit me, it was when I was on a major health kick. My Mom and I worked together in the kitchen, I peeled the apples and sliced them as my Mom would start measuring her ingredients to make the topping. My Mom poured the sugar into the bowl and my first thought was sugar, oh my gosh! When she turned around and went to the pantry for the flour I scooped out some of the sugar. She didn’t know what I did. I thought I was being a sneaky one. She mixed her topping and sprinkled it on the apples and she looked at me and said, “Did you remove some of the sugar?” With a guilty look on my face I said yes. Then I immediately popped the apple crisp in the oven. It smelled amazing! As soon as it came out of the oven we scooped some apple crisp into bowls and at it hot. It was so good! Matter in fact the apple crisp was so good my Husband and I got into a fight. Yes a fight! There was only a small amount of the apple crisp left and he wanted it. I said but my Mom made it, so it’s mine. The fight ended because Little Jenny ate it. My Mom thought we were crazy! You know what my Mom did? She made another batch of apple crisp. Moms are the best! When my Mom came to visit me, she did bring me the recipe. She hand wrote it and put it in a protective paper for me. I was thumbing through my cookbook and there it was. I knew it was the perfect recipe to share with you today. So how does the apple crisp taste? Well you already know it is a family favorite, so that tells you it tastes good, well worth a fight! 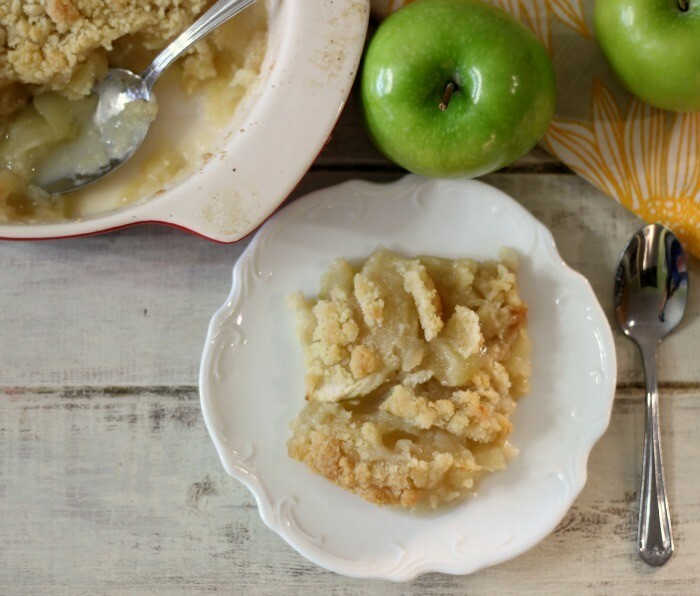 🙂 The crisp is full of plump granny smith apples and topped with a buttery, sugary, sweet cinnamon topping. It’s perfect to go with a big bowl of vanilla bean ice cream or my Mom recommends it with a big dollop of heavy whip cream. Personally, I like to eat it plain with a spoon. 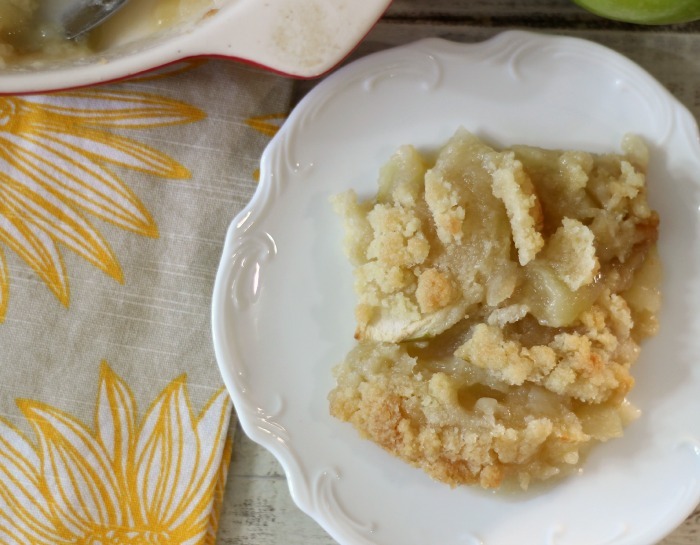 This recipe is very easy to make and highly addicting to apple lovers. 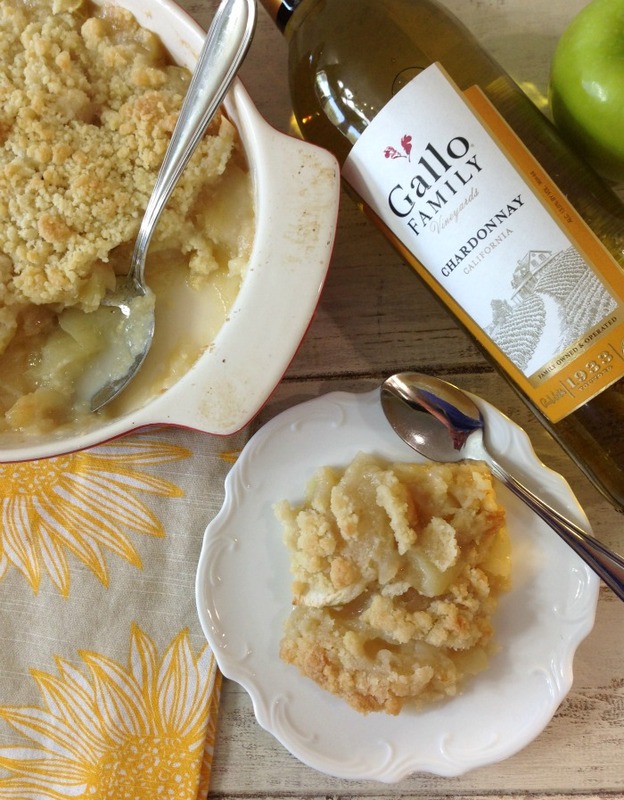 I paired my apple crisp with a nice chilled glass of Gallo Family Vineyards Chardonnay. Gallo Family Vineyards Chardonnay is medium bodied wine with hints of vanilla. A wonderful compliment to apple crisp. This makes for the perfect after dinner dessert. 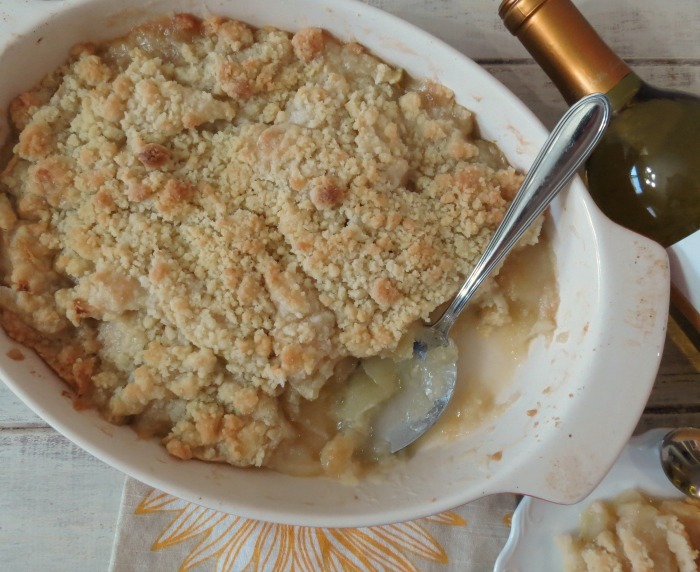 Just sit back, have some warmed apple crisp and a nice glass of wine and you are all set. I also want to share with you Gallo Family Vineyards Merlot. 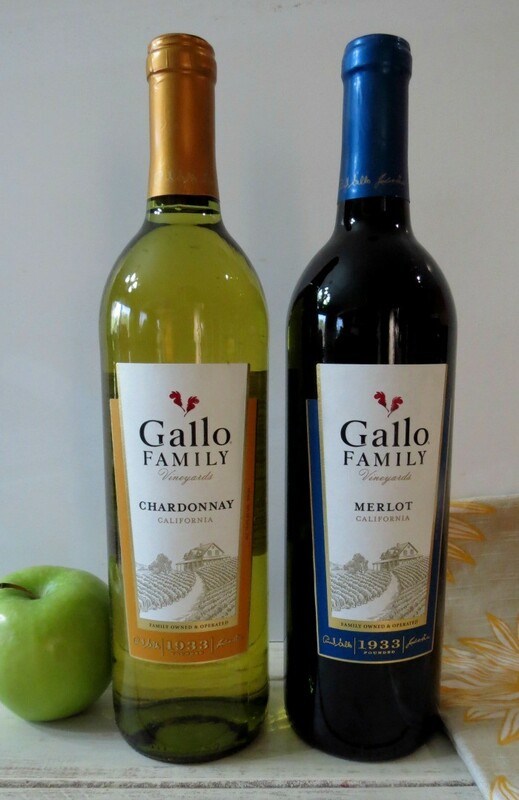 Gallo Family Vineyards Merlot is a full bodied wine with blends of cherries, plum and oak. It goes perfect with pasta, pork roast and grilled meat and vegetables. I personally love Merlot with a plate of pasta, sided with some crusty french bread. Yum! One of my all time favorites. Sweet soft apples, mildly spiced with cinnamony crisp brown crumbs. Butter or spray with cooking spray a 1½ quart baking dish. Spread apples in baking dish and add ⅓ cup of water over the top of the apples. In a bowl, add flour, sugar, cinnamon, and salt. With your fingers rub in the butter until it resembles coarse crumbs. Spread the mixture over top of the apples. Bake in oven for 30-40 minutes or until the crust is browned. Serve with heavy cream or ice cream. To make gluten free add gluten free flour instead of all purpose flour. This recipe really brings back happy memories for me. When my Mom and I made this crisp it was one of our last visits together. She lives in North Carolina and with our work schedules we do not get around to seeing each other very much, which makes me sad. Now that I think about it, it has been 2 years since we have seen each other. Maybe this year we can get together for the holidays? Here is a special link for you to check out. Gallo Family Vineyards Meals with a Special Meaning. If you have a special recipe with meaning, please share your story. I would love to read it. What a wonderful memory and story and an awesome apple crisp too! I’m pretty sure I’d be claiming that last bite too. You know you have a marvelous dessert when you have family fighting over the last piece! This looks an awful lot like my mom’s apple crisp—both winners!!! I still adore a good handwritten recipe and this one looks amazing! I could go for a big heaping helping of that right now, Jennifer! It looks and sounds so good! I can almost smell it. Thanks for sharing your mom’s recipe! I was thinking of trying it with less sugar like you recommend, but I don’t know, mom’s always know best haha I might have to make 2 just to compare! Hi Marion, Honestly a little less sugar and I don’t think you would notice. But I”m with you, try both versions and compare. Hmmm…. Maybe I should do that too? 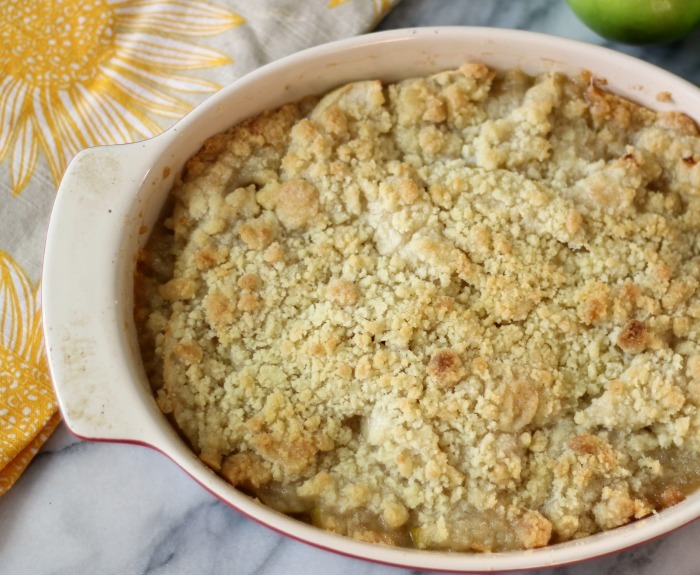 I think you will love this apple crisp just as much as my family does. My hubby loves apple, so think I need to make this one very soon!! I bet he will love this recipe! It’s truly one of my favorites! I always love Apple Crisp! I love you story about your mom and your fight with your husband over the last piece! Your dish looks wonderful!!! Adore her hand-written recipe. Priceless! 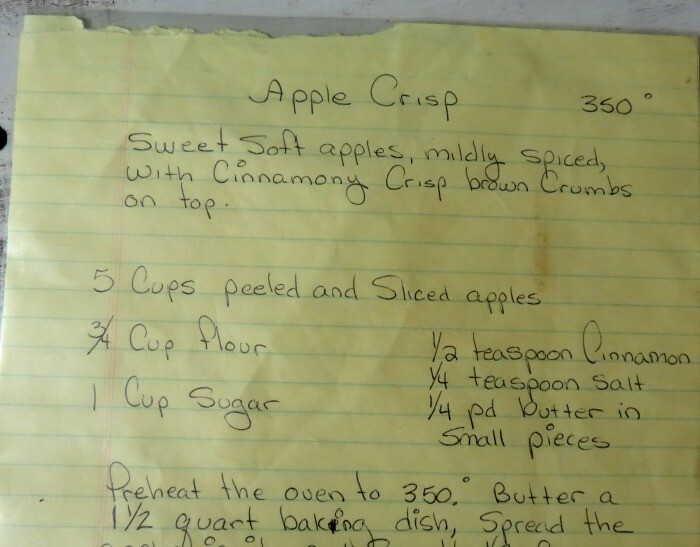 Apple Crisp is my favorite, and your mom’s recipe looks amazing! This apple crisp look absolutely delicious. I need to try this.